One upon a time most currencies were backed by gold. But in 1971 president Richard Nixon took the U.S. off the gold standard switching to a floating currency instead so its Central Bank can exert more influence over the currency, and other countries followed suit. Today, everyone uses fiat currency and gold is no longer relevant on the world’s financial stage. Canada use to have more than 1,000 tons of gold in the 1960’s as part of our foreign exchange reserves. But Ottawa has long forsaken the notion that gold can be a useful diversification tool for a country’s monetary interest. For decades Canada has been slowly selling off its gold reserves, and according to the Finance Department, it only has 77 ounces of gold coins remaining today, which is worth about US $100,000. That’s nothing more than a rounding error compared to the US $80,000,000,000 of total foreign exchange reserves we have. Based on the chart above, we can see that the U.S. central bank holds the most gold by a wide margin. The 8,133 tons of gold held by the U.S. make up 72% of its foreign exchange reserves. The next 3 countries in the list, Germany, Italy, and France also holds more than half of their reserves in gold. It’s interesting how other central banks seem to be holding or even increasing their gold reserves while Canada has done the exact opposite, lol. I’ll write about the possible reasoning behind these two diverging ideologies around gold in a future post, but it has to do with the nature and purpose of Foreign Exchange Reserves, which requires a rather lengthy explanation. The idea of sitting on cash to stay safe and secure sounds innocent enough. But that’s only if we isolate the discussion to one domestic country. Today the world economy is more connected than ever before. Due to low commodity prices Canada’s economy isn’t as productive as it once was. This drives down the price of our currency because global investors are less confident in our productivity. Over the last year the Loonie has lost 20% of its value relative to the $US. This highly purified block of silver was produced by the Royal Canadian Mint. 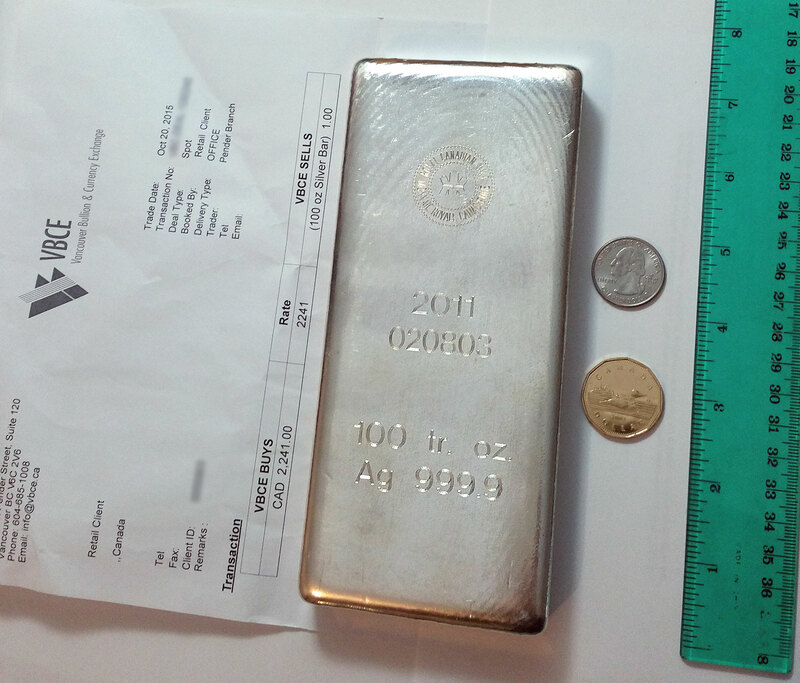 The front of the silver bar shows the RCM signature stamp and the year it was produced (2011,) along with a serial number. The bar is also engraved with the weight of silver in it, and the purity of the metal. 🙂 RCM is known for its quality and its brand is recognized worldwide. There is some clear scratching and general wear on the bullion, but nothing too noticeable. Overall I give this purchase 8/10. 🙂 Great product. A+ experience. Would buy again! After taking some pictures I’ve stored the bullion in my safety deposit box at my bank. I don’t plan to sell it until I retire, or run into some kind of emergency. The U.S. government is nearing its maximum borrowing capacity. If Congress can’t agree on a budget soon they won’t be able to raise the debt ceiling which could mean disaster for the economy. I don’t think anyone is expecting the US to default, but there will probably be a lot of uncertainty in the next week. But one thing we can do in the meantime to protect ourselves against the risk of hitting the debt ceiling is to buy some insurance. So earlier today I went out and bought an ounce of gold for $1,400, and a 10 ounce bar of silver for $250. My purchase was from the VBCE in downtown Vancouver. They are a walk-in bullion and currency exchange business. They accept cash or debt card. You don’t need to show I.D. unless you’re buying a lot of gold/silver. I chose to buy gold because in uncertain times, gold usually does well. It’s currently trading at around $1,300/oz USD. I don’t think there’s much room for it to drop from here. This is my reasoning. First, we know that gold has been a store of value for thousands of years and that’s probably not going to change in our lifetime. So if gold can never drop to $0 then what is the lowest it can go? To tackle this question, have a look at this excerpt from a Globe and Mail article published a couple of months ago. “Many major gold miners have since started reporting what they call their ‘all-in’ cost of production. and Goldcorp Inc.’s hit $1,279 an ounce. …Big names like Barrick and Australia’s Newcrest Mining Ltd.